Trump's tax reform agenda needs you help straight away if it stands a chance at becoming law, plus the news of the week... and MORE! I am not going to let President Trump be criticized for pushing tax reform. ...and I know you are tired of the liberal media slamming Trump at every turn as well. Which is why I am asking you for a one-time monthly donation of just $10 to become an American Opportunity supporter -- today! For some years now, American Opportunity has been filling that gap, providing this new administration with the core ideas and policy recommendations needed to give the American taxpayer a fair break and the American economy the oxygen and infrastructure needed to breathe. Whether it is our 80,000 American Opportunity subscribers, our social media impact, or any number of events where I have the honor and privilege of speaking -- American Opportunity is right there in the mix, fighting for our shared American values and defending the promise of a new 21st century American economy for our children and grandchildren. Trump's tax reform policies will not succeed without your help, which is why I strongly encourage you to become an American Opportunity sponsor straight away. Not only is American Opportunity focused like a laser on true tax reform and economic growth, A/O is a relentless hammer for reminding the American public and policy makers on Capitol Hill the absolute importance of homeland security. Whether that is providing the policy research and the political skills to advocate for a change of policy to help the country, or by publishing proposals and solutions then communicating those proposals to build public awareness and support -- American Opportunity is one of the few organizations out there providing the strength to back the president's agenda -- a do-tank, not a think tank. Our work has included extensive publication of policy ideas, including the "Growth Code", a tax reform proposal used by the Trump administration to model its tax reform schematic -- one that is revenue neutral but will aggressively grow the economy. This past year, American Opportunity published a paper outlining the conservative case for public transportation to get workers to their jobs. American Opportunity published an op-ed on why the US needs tax reform, as well as publishing an analysis of President Trump's UN speech. Just this week, I am scheduled to speak at the CACI Asymmetric Warfare Symposium in McLean, Virginia on October 26, 2017. All of these great things happen because supporters such as yourself help American Opportunity exist. Not only do we utilize "fellows" on staff and adjunct to research and write on the topics of importance, American Opportunity remainse a voice of knowledge and common sense in the Nation's Capital -- one that shapes the debate and carries a voice for the new American majority in Washington. Our success is your success. But as you know, without the financial support of our American Opportunity friends and supporters, we cannot give President Trump and his administration the basic support they deserve -- and need! I don't ask often, but I am asking now. We have a $50,000 giving campaign that ends on October 31st. If everyone who reads this newsletter gave just $10.00 a month? 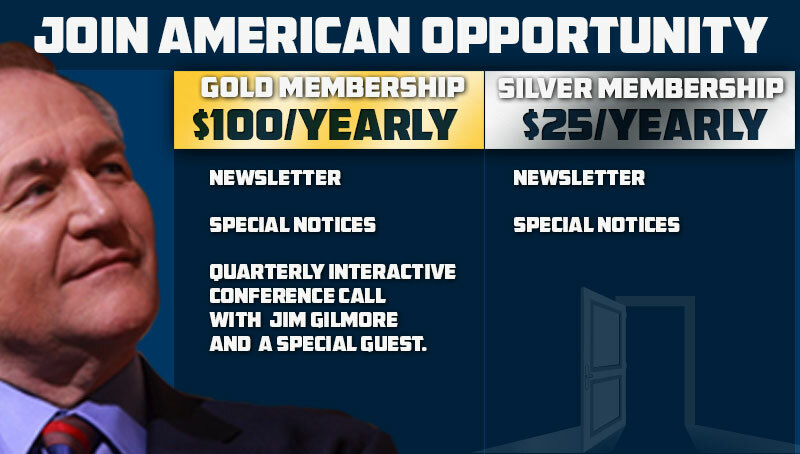 American Opportunity would never have to ask for another dime ever again! ...but not everyone is in a condition to give $10/mo. Which is why I am asking you to support American Opportunity with a generous $50, $100, $250 or even a more tremendous $500 or $1,000 gift straight away. So please decide whether President Trump's agenda deserves your financial support -- because if American Opportunity doesn't have the resources, Trump's tax plan might very well fall victim to the critics and do-nothing naysayers that have plagued us for the last 20 years or more. The liberals in Washington have the entire bureaucracy in their hands, and millions more from Soros-backed groups. All we have is you... and millions of other Americans just like you who know and understand that within Trump's hands remains our last golden shot to recover the America that President Barack Obama and his policies have helped weaken. Can you help with even a heartfelt $35 gift straight away? After the jump, I'll explain why Trump's tax reform bill is so absolutely critical, and how American Opportunity is working to help pass the president's agenda in Washington. Topic two: Tax reform. This is the most important political battle going on right now in our country, one that reflects the entirely different views of right, left and middle in our country. The struggle is going on right now; what remains at stake is the vital future of our country. The country must have economic growth now -- not tomorrow, not in six months, not after the mid-terms, but right now -- today. Our nation is in danger from threats overseas, and a stronger military is needed to face these threats. American workers are being left behind. Their jobs and their opportunities are dwindling. The next generation is frustrated, and can't find quality jobs to start careers. Many are postponing starting families. Some turn to drugs, which are destroying the humans we will need to face the challenges of the future. We lost much ground in the Great Recession. The historic healthy rate of growth in the U.S. is 3.2%, and we have never made up the rate of growth under Obama to recapture those losses. We don't have enough revenue to operate the social welfare state we have built. Demands are made from the left for Medicare preservation, and expansion of Medicaid for the poor -- both of which add to the massive entitlement state that will bankrupt America by 2040 -- or earlier. The federal government has only four options: We can cut spending, but the Democrats are resolutely opposed. We can raise taxes to spend more. Conservatives oppose tax increases, as do we at American Opportunity. Raising taxes slows growth, and places increase burdens on an already overtaxed working class. The third option is to make up the difference by increasing borrowing, issuing government bonds, and increasing the deficit. Conservatives in Congress oppose increasing the deficit. Senator Corker of Tennessee has said he will not vote for a budget that increase deficits. That leaves the fourth path, and we here at American Opportunity believes the only way out is the increase revenue by growing the economy. Targeted tax reform, cutting taxes on business activity is key. Tax reform to encourage investment will improve productivity, create better and more jobs, and get more people paying taxes. The goal is not to cut taxes, the goal is to grow the economy. If, to achieve this, "the rich" get a tax bracket reduction, it must be tolerated to encourage savings and investment by those who seek to increase their wealth by investment. The political left simply won't accept the premise that tax reform can grow the economy. If to have a tax reform there must be a deficit, at least it will be a deficit that leads to investment, growth and more revenue. The American left simply rejects the idea that more investment will lead to more growth. Our view is that we should put the problem to the American left. "If you don't believe tax reform will grow the economy, what is your idea to grow the economy? The status quo of slow growth and lack of revenue won't work. What is their idea to grow the economy? We have heard the message in opposition: "This is just tax cuts for the rich". OK. What do they propose to grow the economy? Last week I attended a meeting with the President's staff to discuss the tax reform proposal. When asked my advice was: "Keep the message simple. This is not just tax cuts to buy votes; a "tax cut for the middle class"but a tax reform for growth, opportunity, better jobs an careers, for hope and opportunity through growth." If we fail to achieve tax reform for growth, we face a future of slow growth, low tax revenue, stagnation and frustration. That is the alternative we must avoid.